Only two titles on the list today. I was going to add a Lee Smith novel here as well but I ranted on so long about Ayn Rand’s Atlas Shrugged (which is kinda funny given the reason I give below for not finishing it) and The Fountainhead that I think I’ll give Ms. Smith’s lovely little book its due in the next installment. With that said, you’ll find two more of the BESTEST BOOKS EV-AH below. If you’re familiar with Peter Matthiessen’s work, Far Tortuga may seem an odd choice for this, a list of books I’d want with me on a desert island. He’s far better known for novels such as At Play in the Fields of the Lord and the Shadow Country trilogy, as well as nonfiction like In the Spirit of Crazy Horse. Far Tortuga is, or was at the time, worlds apart from anything else he’d produced, a novel written almost in verse and definitely in a non-traditional format. The sea and its Caribbean environs are characters just as important as the crew of the ill-fated turtle hunting boat, the Lillias Eden, whose last voyage is the subject of the book. 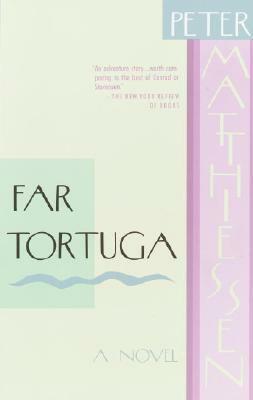 I came to Far Tortuga already a Matthiessen devotee, having discovered him along with Edward Abbey (see my Baker’s Dozen, Part I post, October 19, 2015) in my mid-twenties, and I had already read In the Spirit of Crazy Horse, The Cloud Forest, and African Silences (all nonfiction) when I picked this up for the first time. The words on the page look and read like a prose poem, not the pedestrian paragraphs of your Average Joe of a novel, so I, not being the biggest poetry fan in the world, gave this book the big ol’ side-eye when I turned to the first page. But I found myself drawn into the Calypso-like rhythm of the sailors’ voices (“…Speedy-Boy, you best cotch turtles one time in dis life just so you know it”) and what I thought was going to be a chore to read flows like the clear, blue Caribbean itself. Matthiessen, along with that cantankerous Abbey, was somewhat of a hero of mine back in the day. In addition to being an award-winning writer (he won the National Book Award three times), he was a naturalist, environmental activist, co-founder of The Paris Review, and, believe it or not, for a period of time a CIA agent! Matthiessen and Abbey went to town on my brain in the early ‘90s as I gobbled up book after book written by the both of them, and together they imbedded into my grey matter a still-unwavering love of nature and wilderness. I was never the same after encountering those two. Sadly, Peter Matthiessen died last year at age 86 after a battle with cancer. We still have his words. But, unlike Alice, I do get Rand’s point. She told me once and I got it the first time. Didn’t need to hear it again. I finally gave up about two-thirds of the way through. I’ll give it another shot sometime in the future. After all, my relatively non-bookish Hubs finished it and liked it, and I can’t let him show me up. But, oh yeah, I was supposed to tell you why I like The Fountainhead, which is, in my opinion, the best Ayn Rand book and one of my favorite books of ALL TIME. It was given to me, again in my mid-twenties, by an attorney I worked for at the time who was also a good friend. I don’t know why he thought I’d like it and I was a little perplexed when he gave it to me, but his gift was spot on. Rand’s story is of an unconventional, Frank Lloyd Wright-ish, up-and-coming young architect, Howard Roark. Roark is highly innovative, absolutely refusing to give in to convention with his designs, and this is the account of his fight against rivals who are threatened by his genius and will try destroy his reputation at all costs. His unwillingness to cave in the face of the interminable obstacles that he faces in his rise to the top of his profession is pretty damned admirable. Believe me, his enemies throw everything AND the kitchen sink at him trying to bring him down. You know, I really can’t pinpoint exactly why I like this book so much. It’s about architecture, which doesn’t exactly blow my skirt up. I know an ugly building when I see one, but other than that, my knowledge and interest in the subject goes about as far as Frank Lloyd Wright. And who doesn’t know Frank Lloyd Wright? It’s a book I don’t think I would have picked up on my own at the time (or maybe even now), but since it was given to me I felt obligated to read it and then, all of a sudden, I couldn’t get my sniffly, allergy-ridden nose out of it. 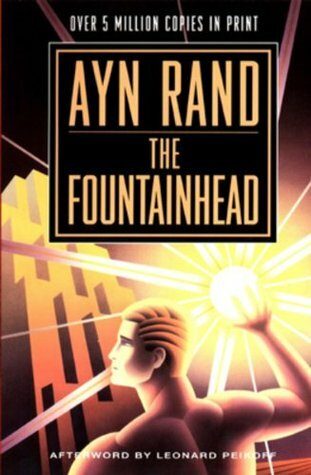 It is very dramatic, with lots of tension and teeth-gnashing, and I think it just comes down to the fact that Ayn Rand wrote an epic potboiler of a novel. In any event, along with Far Tortuga, it’s time for a re-read. Part III of the Dozen is in the offing, and I suspect it will have strong whiff of Southern Lit to it (smells like magnolias, ya’ll) as well as a little dab of fantasy. Adios, peeps!